This is the part of Hadrian's Wall that I remember fondest from my childhood, the excitement of the small museum on entry and walking on the great wall. I also remember falling off said wall while holding my dad's new and expensive camera, but that's another story entirely! This is the only stretch of the Wall that you are allowed to walk on, as it is a scheduled ancient monument it is illegal to walk on the vast majority of the Wall. This is arguably the most popular part of Hadrian's Wall to visit and walk from, the panoramic vistas are simply stunning. The fort is perched up high on a ridge and is now the most complete Roman Fort in Britain and is the ideal place to experience how the Romans lived. If I was forced to choose one place on Hadrian's Wall to visit above all others then it would have to be Housesteads, English Heritage members enter free, visit their website for more information. 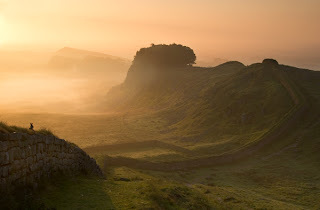 Hexham and Hadrian's Wall to the West is easily accessible by road, being just a short distance from the A69 that runs from a junction at the A1 at Newcastle right through Hadrian's Wall Country to Carlisle. Running almost parallel to the A69 throughout the area is the B6318, known locally as the Military Road. This road runs along Hadrian's Wall for most of it's very straight run from Heddon on the Wall in the East to Greenhead in the West. As you will see from the map above all of the most popular attractions along Hadrian's Wall are, rather unsurprisingly, very close to this road. By Public Transport, Arriva run a regular bus service from Newcastle to Carlisle that stops in Hexham, Haydon Bridge, Bardon Mill, Haltwhistle, Greenhead and Gilsland. There is also an Hadrian's Wall Country bus that covers a lot of the area surrounding Hexham. It runs from Easter until the end of October each year, details of the various routes can be found on the Hadrian's Wall Country website and we can recommend this service as an excellent way of exploring the area. Go North East also run a bus between Hexham and Newcastle that calls at Corbridge, Stocksfield, the Metrocentre and Prudhoe amongst other places. There is a Train Station in Hexham with a regular service to Newcastle in the East and Carlisle in the West. This line has stops at Haltwhistle, Hexham and the Metrocentre.